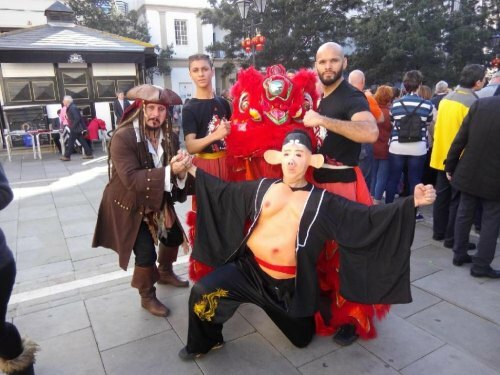 The Gibraltar Chinese Association hosted their annual Chinese New Year Celebrations on Thursday, with three separate celebration ceremonies. This began at 4:15pm in the John Mackintosh Square with a Firework Display, Lion Dance, Kung Fu show and Tai Chi Display. This began Two additional displays took place in Casemates Square at 5:30pm and in Ocean Village at 7pm. Prior to its commencement in John Mackintosh Square, the Hon Joe Bossano announced that although he could not stay to watch the celebration ceremonies this year, he was flying out to Zurich ‘in ten minutes’ to discuss Gibraltar and China’s excellent relationship. A large red Lion and Pig amused the crowds which marked the Chinese Year of the Pig. The Lion Dance was performed by Master Lin Cunguo’s Henglong Kung Fu Club with students including Daniel Daszeh-Green and Yusuf Chaudhri as the Lion and Khoa Vi as the Pig. Local Rock Tai Chi Club performed next with their display, including instructors Dilip Tailor, Lorry Doyle and Marie Fox. The Kung Fu show was next with Li Shengqiang performing as ‘Bruce Lee’ who amazed the crowds with his displays, including breaking ping pong balls, chopsticks and glass with only his fists.